Our first stop after picking up the car in late May was Bordeaux (notice a wine theme yet?). We were excited to explore the wine growing regions of this world famous area and see if we could learn and taste some of the most expensive wines in the world. We quickly realized however, the French don’t exactly do things like the rest of the world. There is no “showing up” to vineyards to taste the wines. No, you have to be somebody important and set up reservations well in advance. We are not anybody and definitely did not set anything up, so we just figured being in town would be good enough. Our first night we were exhausted from a long drive from Paris. We decided to go into the tiny town of Blaye and seek out a wine store. We found a cute spot that was serving tapas and started inquiring about some wines we could bring home. Zero English. Before we knew it, the owner summoned an older lady from down the street who spoke English to help us with a wine selection. She seemed quite knowledgeable so when we asked her what her background was she answered, “Well, I am a winemaker.” Boom! Kirby worked her magic and before we knew it we had a friend in Bordeaux! She recommended a few places to go and taste, some terrific wines to experiment with at home and before the end of the week gave us an extensive tour and lesson of her own Chateau (more on that in a bit). Over our three days in Bordeaux we explored the amazing town of St. Emilion, the actual city of Bordeaux and explored the left bank where some of the world’s most sought after wines are made from producers such as Chateau Margaux, Latour and Mouton-Rothschild. The French Bordeaux classification system is something we took a lot of time to learn while we were there and we would describe it best in one word: complicated. Furthermore, a lot of the rules the French still live by are from Napoleon! Weird. Too much to get into here, but we thought when we had a few hours we would produce our version of a European Wine Guide. May be helpful for anyone going to check out these regions. 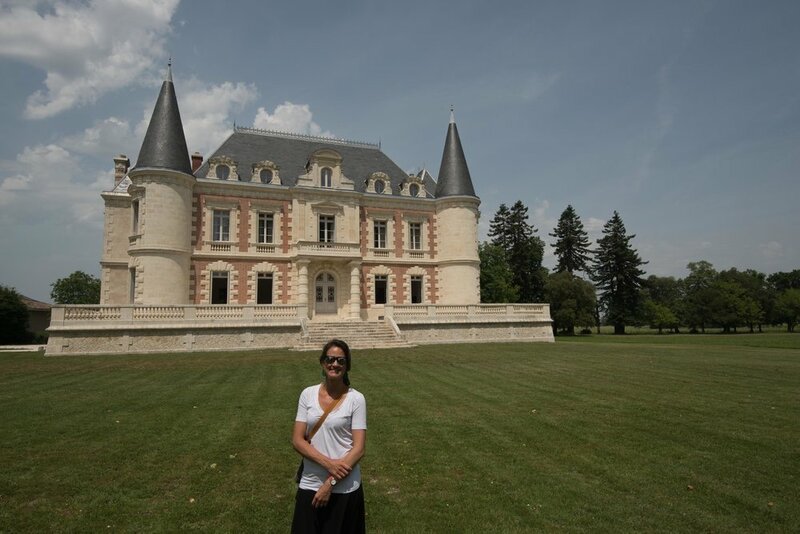 Anyways, we did tastings at Chateau de Ferrand near St. Emilion and Chateau Lamothe-Bergeron in Paulliac, but the most memorable experience was visiting our friend Florence at her house Chateau Cantinot. She gave us a tour of her winemaking facilities, let us taste her wines and even explained how she and her family came to be winemakers: Her husband Robert had been a broker and decided, no matter what, when he turned 50, he would fulfill a lifelong dream to become a winemaker. Amazing! Over the last 15 years they have learned trial-by-fire and now produce over 150K bottle per year! Quite an achievement and the wine was actually pretty darn good. Even though we didn’t get to taste the big boys everybody talks about, experiences like Chateau Continot are what make trips like this awesome! Totally by chance but we got the best lesson about Bordeaux wines we ever could have by folks who live and breathe it everyday! Our next stop was to the Provence Region of France, which is in the south of the country and features many of France’s national parks, picturesque beaches, mountainous regions and of course the famous lavender fields. The latter is what we were after so we picked a spot smack in the middle of Luberon Natural Regional Park right next to a tiny town called Viens. We had an amazing Airbnb here that was situated at the top of a large hill overlooking fields and fields of green lavender. Wait green?!?! Yes, because we did ZERO research as to when the lavender actually blooms, we quickly realized we were about a month and a half too early. Whoops! So over the course of the next three days we hiked, caught up on some sleep and explored as much of this area of the world as we could. One thing is for sure, the Provence region of France is beautiful and we cannot imagine what it must look like when all of those green fields turn to purple. We made a pact that if we could fit it in, we would return on our way back to Paris to try and catch a glimpse of this famous lavender. As we left France and headed to Switzerland we basically had to drive through the entirety of the Luberon Natural Regional Park and we could not believe how beautiful it was. We also were shocked at how mountainous it was! Steep peaks, windy mountain roads and sprawling landscapes took us all the way from Viens into Switzerland. We had spent five days in Switzerland and another 25 in Italy before we returned to France yet again. We started our time back in Nice, France which is one of the bigger French Riviera cities. We were originally going to stay for a few nights but ultimately decided we wanted to chase down that lavender so only stayed two. During our short stay, we explored this awesome beach town and also did a day trip to Monaco, which is only about a 30-minute drive from Nice. While in Monaco, we explored the famous Monte Carlo casino and gawked at all the giant yachts and expensive cars. Nice is an awesome place to relax in the south of France. The beaches are beautiful (though they are made of rock, not sand) and we found it to be way more relaxed than the surrounding areas, such as Monaco and Cannes. Furthermore, it is a great launching point for the various day trips you can take in the south of France. Since we were so dead-set on seeing the famous lavender fields, we cut our time in Nice short by a night and headed back into the Provence region. This time, we find a small B&B in the town of Gordes to park ourselves for the night. The first thing we did on the drive was find our old Airbnb and drive the narrow road down the mountain to see if those fields had indeed turned purple. To our luck, they had! Even in July we were still probably a few weeks early to truly get the rich deep lines of purple you see all over, but it was still awesome to have seen it green and now transformed. We spent some time photographing our old fields and then headed to our hotel where we enjoyed a nice dinner and a pool table before crashing. The next morning we got up super early and went to explore the world famous Senanque-Abbey. If you have ever googled a picture of “lavender” or “lavender in France” or any variation of that, you have probably seen a picture of the Abbey. It is a working Christian Monastery but is home to some of the most beautiful fields of lavender in the world. The monks there maintain these fields as well as make honey on the property. While again, the fields were not totally in bloom, it was still magical to explore this sacred place as the sun was rising. We had heard the monestary can turn into a tourist nightmare, but arrived early enough so we could explore in the peace and quiet. We could even hear the monks chanting as we walked around the grounds, it was pretty cool. After some photographs we headed back to the hotel, had some breakfast and then packed up for a drive to do some more wine research! Ahh another wine stop for us…however, if there was one we were looking forward to the most it was probably this one. While Burgundy is easily one of the most famous wine growing regions in the world, it is also home to our two favorite wines: Pinot Noir and Chardonnay. In fact, 98% of what is grown in Burgundy are these two grape varietals. Perfect for us! 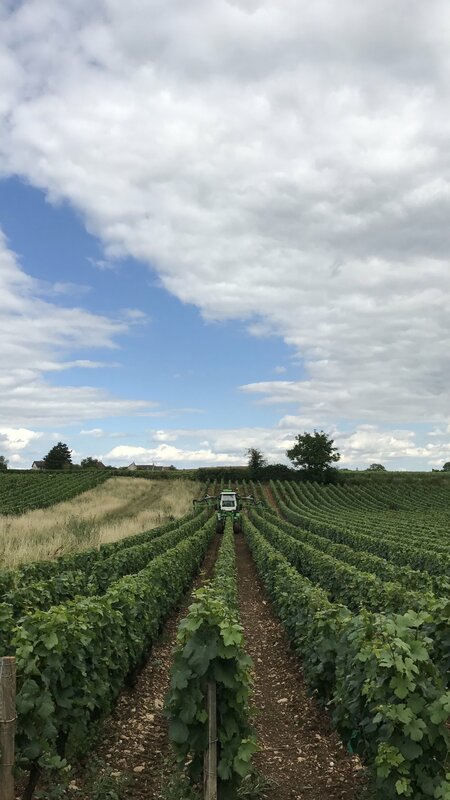 Our Airbnb was located in the tiny town of Magny-les-Villers, which is situated at the top of the Cote de Beaune, where some of the world’s most well-known and expensive Chardonnays are grown. Right above us was the Cote de Nuits, where some of the world’s most well-known and expensive Pinots are grown. Add them together, and you have the Cote d'Or, one of the world’s most famous wine growing regions on the planet, and we were right in the middle of it! 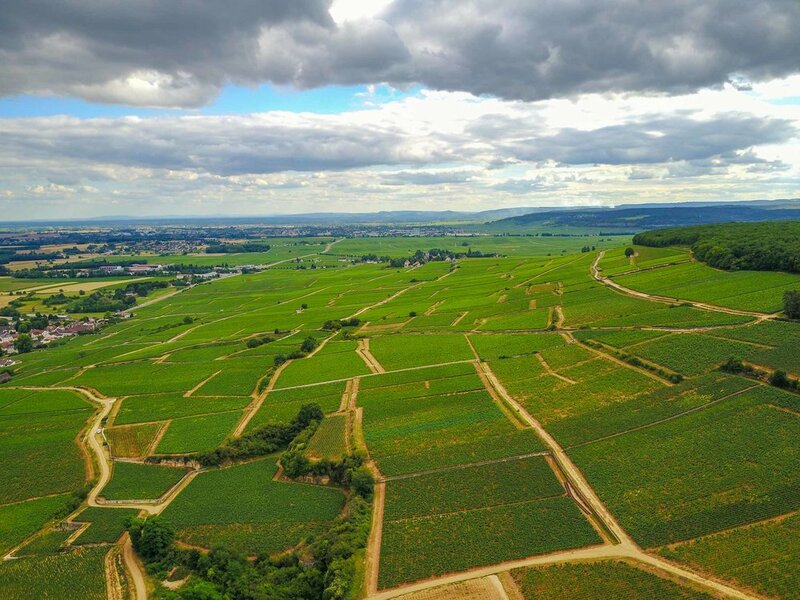 While Burgundy actually has five growing regions, we focused on these two because together they are home to the majority of the “Grand Cru” wines from this region. #1 – There are grapes everywhere, but they seemed to be concentrated in a narrow band that runs north/south and along the steep hills above. #2 – We did not see any “estates” or “chateaus” or anything resembling a working vineyard. #3 – The grapes themselves were pristine. Pruned, cared for and constantly being tended to by workers 24/7. It was cool to see. What we learned over the next three days was one of the coolest things we have encountered in trying to learn wine: everything in Burgundy (the quality, the ratings, the classifications) all focus on the terroir (“ter-WAH”), which essentially means all of the environmental factors (geography, geology, etc.) that affect each vineyard. This means that all the wine producers, estates etc. share the land and hope their grapes are grown on the best terroirs. So awesome! This simple fact explains why all the grapes grow together and are in pristine condition, because everyone in town has a vested interest in that land. During our time here we tasted at a few different estates, shops and learned as much as we could. 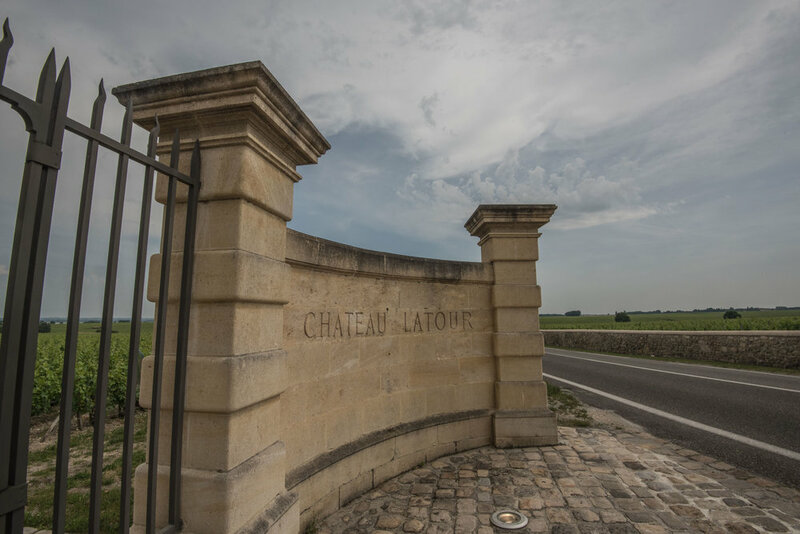 Perhaps our best was driving the famous, “Route de Grand Crus” across the various regions and passing by some of the world’s most famous producers such as Domaine Leroy, Romanee Contee and Gevrey-Chamberton. It was a very cool experience for us especially since we now understand how everyone in Burgundy shares the land. It was awesome to drive through the various vineyards and see the markers people put on certain lines of grapes signifying "this row is mine". 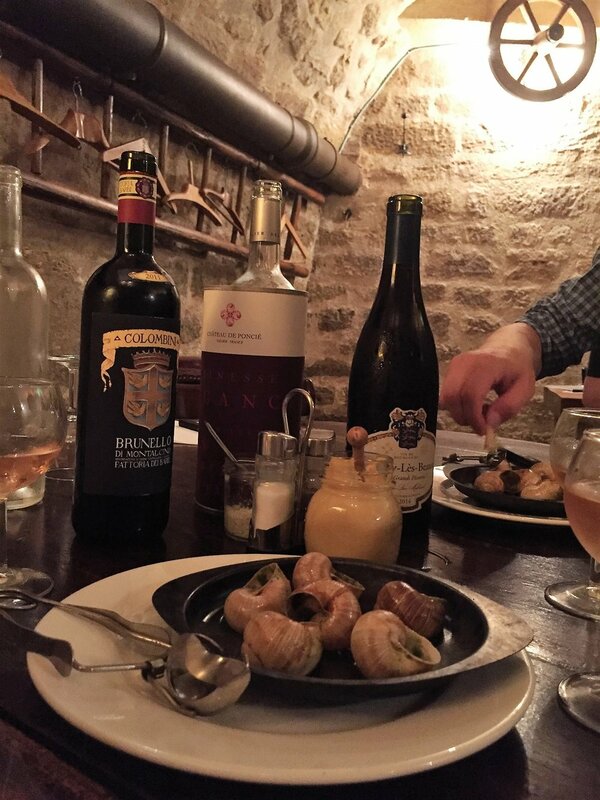 If you're a fan of Pinot Noir, Chardonnay or just wine in general, Burgundy is a must-go! The towns are charming, the people are friendly and you will see a way of life that totally revolves around the land; unlike anything we have ever seen or experienced. It also is a bonus that we now know how to read those pesky French wine labels! After three amazing days in Burgundy we headed north for our last stop in Europe…Paris. The “City of Lights” has a special meaning for us, because it was the first city in Europe we went to together. We went to Paris last year for Kirby’s 30th Birthday and it is probably what set this whole travel idea in motion. It was fitting we would end the first leg of our journey here. 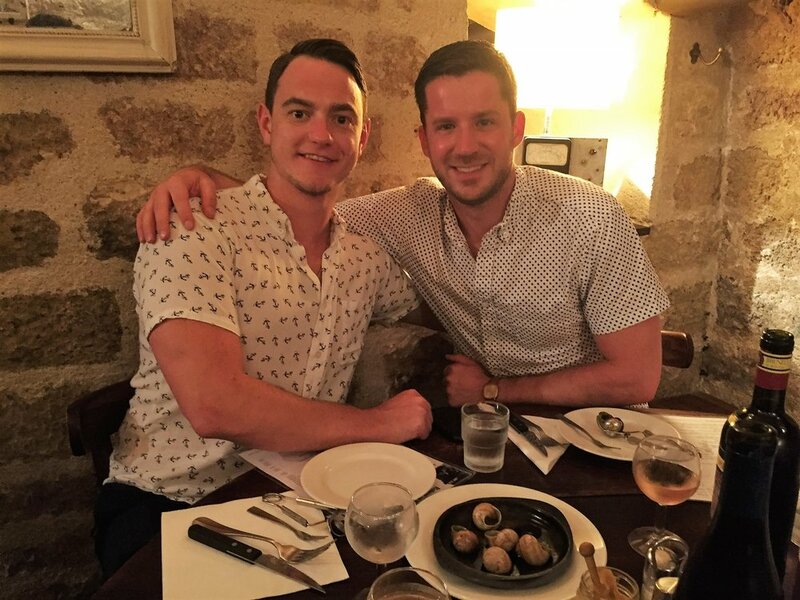 The other bonus was that we got to spend our few days in Paris with some of our best friends: Hunter and PJ! Hunter and Nolan have known each other since grade school and he has been one of his best friends ever since, so it was awesome to see some familiar faces in such an amazing city. Day Two started by saying goodbye to an old friend, our rental car :( It was time to move on and prepare to head to our next destination and the car would no longer be necessary. The Toyota travelled with us over 8000km, through three countries and countless meals, tunes and podcasts. After we got the car back, we walked…all over Paris. We had done this on our last trip, but that was in January and now in July it was hot. We started by the Louvre and headed over to our favorite museum: the Musee D’Orsay but arrived too late to see it again. We then walked up the entire Avenue des Champs-Élysées and climbed to the top of the Arc De Triomphe, which gives you one of the most incredible views of the city. This is something we had not done last January, so was awesome to see. After all the walking we were smoked, so we recharged at a café and then walked to the Eiffel Tower to rest and wait for sunset as well as the “lighting of the tower.” Since it was a Friday night there were lots of people having picnics, playing music and sipping wine. It was a lot of fun to rest, cool off and watch the sun go down and tower light up. After this we walked back towards our place, but on the way stopped to photograph the Notre Dame at night, find our lock we put up in January 2016 and then crash before our early am flight. While this time around we did not do any museums, we were comforted knowing we had seen all the big ones last January and also got to experience some new things we had not done before such as Versailles and the Arc. It was also a ton of fun to spend three days in this amazing city with great friends. We got quite sad leaving Paris early Saturday morning. Not only were we leaving an amazing city, but also leaving Europe. We left home on March 28th and had been nonstop through (mainly) Europe since then. It felt quite strange to be leaving it behind, especially since it felt like we had just got there! We think it will take us quite a while to take a step back and appreciate all the things we have seen and experienced thus far. While we realize that sounds absolutely crazy, we still do not think it has fully hit us! While this chapter has come to an end there is no question we are going to continue! We have loved every minute and learned a ton about other cultures, ourselves and each other. We originally were going to head east and start our journey in Asia, but decided to make a sudden change to experience something else that was on our bucket list….but stay tuned for that! Europe, it’s been a blast! See you next time!